Shadows on the Moon by Zoë Marriott. Candlewick, 2011. Currently Available. 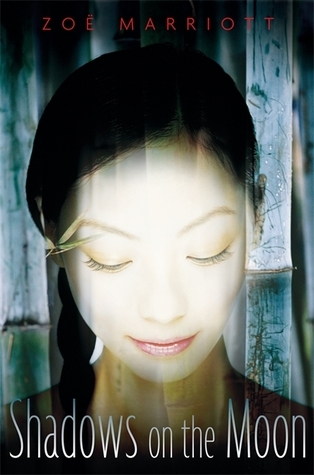 Face Value: For the most part, I like this cover (top) The girl’s face is identifiably Japanese (sadly, not always a guarantee), and we see her whole face. I love illustrated images, rather than models in cover art. Overall, I think that it’s really pretty, intriguing and accurate. I definitely like it better than the British version (bottom), where Suzume’s face is obscured by generic cherry blossoms. With this concept at its heart, it seems inevitable that the book would be Slatebreaking, and it lives up to expectation. Suzume is a strong, dynamic character who is fueled by her desire for both revenge and rightness. While this is certainly not the first badass Cinderella we’ve read about (or even reviewed on this blog recently) this is a character and a story that is breaking all kinds of slates in its own way, not just as an answer to a decidedly un-Slatebreaking traditional story. Who would we give it to? Well given that this is my second review in as many weeks of a Cinderella adaptation, I think that it’s still fair to say that there’s a widespread audience for fairy tale retellings. 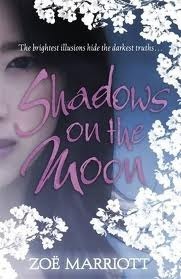 Shadows on the Moon is a more subtle adaptation than some of the others’ I’ve read – it really holds up on its own strength of story and character – but the essential Cinderella elements are all there, and fairy tale aficionados will appreciate the cleverness with which the original tale is woven into the story. Review: I’m so thrilled to finally be reviewing one of Zoë Marriott’s books, because I actually discovered her online persona, via tweeting from our Slatebreakers account, before I had ever read any of her books. I don’t know that this one would have been on my radar otherwise. And I’m so glad I read this book. Richly crafted fantasy, with compelling feminist characters: I’m totally hooked. Suzume is a privileged young girl, growing up happily with her father, mother and beloved cousin Aimi, who she loves like a sister. But this is a fairy tale. So we don’t get much more than a glimpse of this happy life before tragedy strikes. The prince’s men show up out of nowhere and kill her father and her cousin. Suzume only barely escapes, hiding in the ashes of a servant’s fireplace. But Suzume’s survival is actually only the beginning of her tragedy. Her mother remarries quickly, to the wealthy Lord Teryama, and seems to wish to pretend the devastation of their former lives never happened. Without Youta also a shadow weaver, she would have had nothing and over time he teaches Suzume to learn the art of creating magical illusions. But when she discovers Teryama’s role in her family’s death, she no longer has the pretense of safety in his home. Escaping first to the kitchens as a servant, and then to the city streets, Suzume becomes entirely focused on avenging her father and cousin. The story is surprisingly dark and Suzume is not a helpless little victim. She’s also not completely blameless – her focus on revenge leads her to dangerous, potentially unforgiveable acts. I appreciated both the acknowledgment of the darkness present in fairy tales to begin with, and the power that is given Suzume over her own story. In the original Cinderella she is all passive victim – ending up in the ashes purely out of the cruelty of her stepmother and ending up at the ball purely out of the kindness of her fairy godmother. She takes no direct action on her own behalf. Suzume on the other hand, certainly falls victim to plenty of cruelty, but a large part of her circumstances are her own doing. She makes conscious and sometimes reckless choices that affect her fate. This makes her responsible for some terrible things in her own right, but it also makes her responsible for her own destiny. Marriott also does a lovely job of showing us Suzume’s response to grief and trauma. Unlike the passive fairy tale heroine who calmly weathers her terrible circumstances until her rescue, Suzume is devastated by what has happened to her, and has no outlet for her emotions. While she is trapped in her mother and Lord Teryama’s house she cuts herself, and at one point attempts suicide. This is always hard to read about, but the author does a good job of contextualizing her pain, how she deals with it, and how she ultimately is able to stop hurting herself over time. I am by no means an expert, but I felt that the way Marriott dealt with self-harm was woven well into this story, without glorifying or minimalizing. There is romance in this book, and it does factor into the ultimate redemption/happy ending we get to in the end, but the romance is built on mutual attraction, respect and love that grows over time. And – what I found both frustrating and satisfying about the it – for a large part of the book it is not circumstance or evil forces that keep Otieno and Suzume apart. Instead it is Suzume’s choices, her single-minded focus on revenge that brings her to make difficult decisions. Otieno is a wonderful character, and the relationship that develops between them is both fairy-tale magical and plausibly developed over the course of the story. I’m so glad that this blog led me to discover Ms. Marriott’s writing – I am definitely going to seek out her earlier work now. This entry was posted in Reviews, Young Adult and tagged Cinderella, Fairy Tales, Fantasy, Japan, Retellings, Self-harm. Bookmark the permalink. I hadn’t heard of this one before but it sounds AWESOME! I love this different take on the Cinderella story, where she is no longer passive, but an active character in her own story. I’m going to be adding this one to my reading list!! Thanks for introducing it to me. Cinderella does really seem to be sort of a “trend” I have seen lately. I really liked your explanation on the Cinder review of why it is a popular story/why people like it.